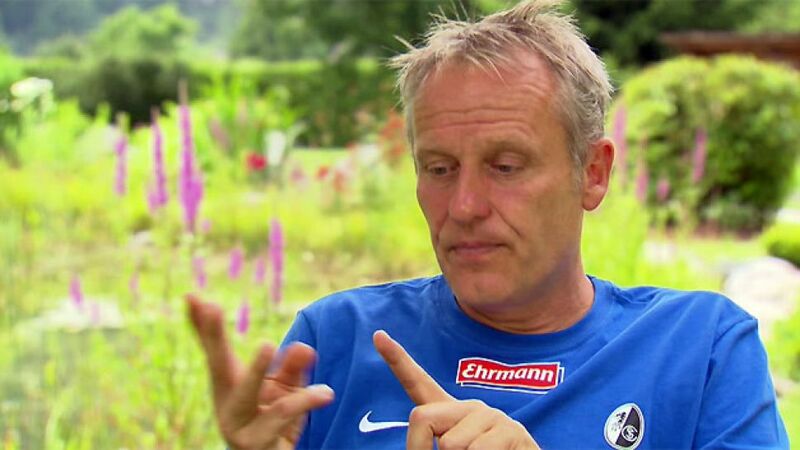 Streich: "It's going to be a real adventure"
Freiburg - Following an astonishing campaign last term, SC Freiburg could well be victims of their own success in the 2013/14 season, according to their charismatic coach Christian Streich. Joy in qualifying for the UEFA Europa League has been tempered by the realisation that it could well be a double-edged sword, and Streich recognises his club could struggle initially. Accustomed to the regular routine of one match per week, with the odd exception, the Black Forest outfit will now have to get used to the added strain of European football. Exactly how they are going to cope remains a mystery even to Streich, who was still scratching his head long after the cameras had stopped running on his interview with bundesliga.com. “We’ve got a very, very big challenge ahead,” said the 48-year-old. Streich is no stranger to unorthodox training methods, but he admits that even he is dumbfounded about how to fit in at least six Thursday night European matches between now and the New Year. “You know, it’s going to be hard because our weekly schedule has always consisted of playing on a Saturday, recovering on a Sunday and then analysing the game and working on things in training throughout the week,” he said. “We used to have Wednesday off, but now we’ll be playing on Thursday so how are we going to do that?” Streich is seeking the right blend to keep one of the smallest squads on the Bundesliga circuit in tip-top condition while honouring two competitions which mean a lot to the Freiburg faithful. VfL Wolfsburg and Borussia Mönchengladbach are two opponents who face Freiburg after a Europa League fixture, and Streich feels they will have an unfair advantage. “They’ll spend all week waiting for Freiburg to arrive with their swords drawn,” he added. “It’s extremely complicated for us. It’s going to be a real adventure. Mike Hanke knows all about it having reached the last-32 of the Europa League last season with Gladbach. He will now be looking to bring his know-how to help Freiburg’s cause, having convinced Streich straight away of his hunger. “He’s totally obsessed with football,” the Freiburg coach said.